Steven recently saw an announcement that Microsoft R Open now handles multi-threaded processing (default R does not), so we were interested in trying it out. I installed MLR/MRO on Emu/Roadrunner (Apple Xserve; Ubuntu 16.04). Followed the Microsoft installation directions for Ubuntu. In retrospect, I think I could’ve just installed MRO, but this gets the job done as well and won’t hurt anything. # Use Microsoft R Open instead of default R version. # to restore default R version. I have confirmed that R Studio Server on both machines starts up and is using MRO instead of the default version of R.
Per this GitHub issue, I’m IDing transposable elements (TEs) in the Crassostrea virginica genome. Default settings (i.e. no species select – will use human genome). The idea with running this with four different settings was to get a sense of how the analyses would differ with species specifications. All runs were performed on roadrunner. 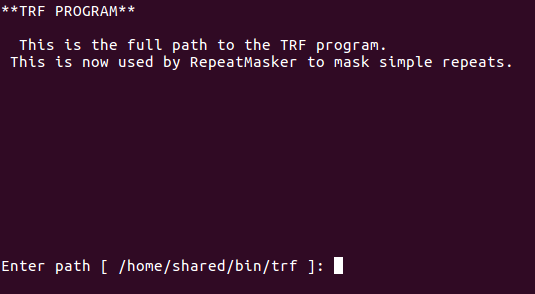 NOTE: RepeatMasker writes the desired output files (*.out, *.cat.gz, and *.gff) to the same directory that the genome is located in! If you conduct multiple runs with the same genome in the same directory, it will overwrite those files, as they are named using the genome assembly filename. Be sure to move files out of the genome directory after each run! Both Apple Xserves (Emu/Roadrunner) running Ubuntu (16.04LTS) experienced the same issue – the monitor would indicate “No Video Signal”, would go dark, and wasn’t responsive to keyboard/mouse movements. However, you could ssh into both machines w/o issue. Difficult to use for other lab members who aren’t as familiar with SSH – specifically if they would want to use a Jupyter Notebook remotely (this would require setting up a tunnel to their own computer). Can’t use Remmina Remote Desktop until a user has physically logged in from the Ubuntu login screen at least once, in order to launch Remmina. The second aspect was the major impetus in me finally being motivated to deal with this. Accessing these computers via remote desktop is much easier to manage long-running Jupyter Notebooks instead of relying on an SSH tunnel. The tunnel greatly limits my access to the Jupyter Notebook outside of the computer that has the tunnel set up. Well, this led me down a horrible rabbit hole of Linux stuff that I won’t get fully in to (particularly, since I didn’t understand most of it and can’t remember all the crazy stuff I read/tried). For some reason, Roadrunner did not take kindly to those changes and it took a long time to resolve, ending with changing permissions on ~/.Xauthority back to their original permissions (they got altered when I ran some command – sudo startx or something) to get out of a login loop. Regardless, both are fixed, both can be used when physically sitting at the computer, and both can be accessed remotely using Remmina! I previously performed this analysis using a different version of our Ostrea lurida genome assembly. Steven asked that I repeat the analysis with a modified version of the genome assembly (Olurida_v081) – only has contigs >1000bp in length. The idea was to get a sense of how the analyses would differ with species specifications. However, it’s likely that the only species setting that will make any difference will be Run #2 (Crassostrea gigas). 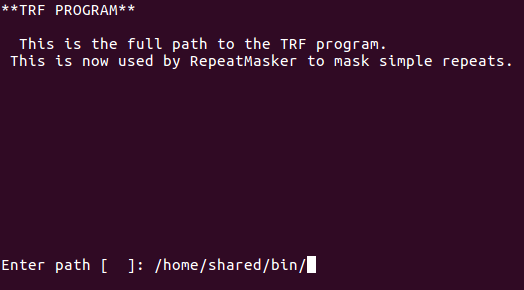 NOTE: RepeatMasker writes the desired output files (*.out, *.cat.gz, and *.gff) to the same directory that the genome is located in! If you conduct multiple runs with the same genome in the same directory, it will overwrite those files, as they are named using the genome assembly filename. I ran RepeatMasker (v4.07) with RepBase-20170127 and RMBlast 2.6.0 with species set to Crassotrea virginica. Steven wanted transposable elements (TEs) in the Olympia oyster genome identified. 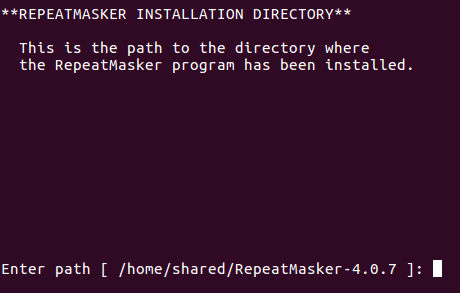 After some minor struggles, I was able to get RepeatMasker installed on on both of our Apple Xserves (emu & roadrunner; running Ubuntu 16.04LTS). Steven asked that I re-run some Olympia oyster transposable elements analysis using RepeatMasker and a newer version of our Olympia oyster genome assembly. Installed the software on both of the Apple Xserves (Emu and Roadrunner) running Ubuntu 16.04. 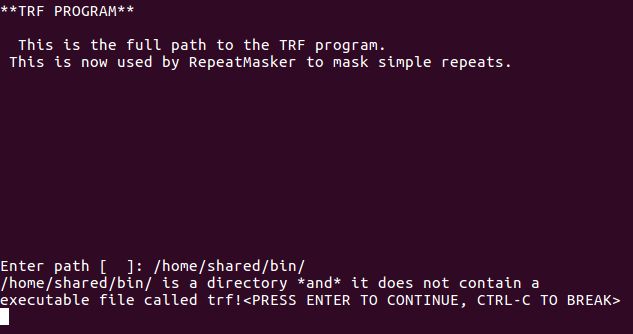 Saved file (trf409.linux64) to /home/shared/bin. NOTE: /home/shared/bin is part of the system PATH. See the /etc/environment file. 3. Downloaded RepBase RepeatMasker Edition 20170127 (NOTE: This requires registration in order to obtain a username/password to download the file). Currently re-building RMBlast and it takes forever… Will report back when I have it running.